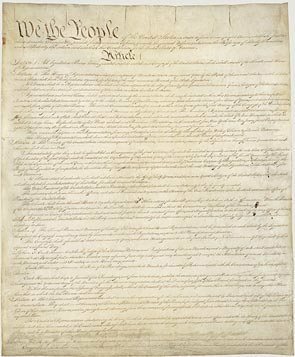 The fundamental constitutional right to justice is guaranteed in the first ten amendments to the Constitution, known collectively as the Bill of Rights. It includes the cornerstone rights enshrined in the First Amendment: freedom of religion, speech, the press, assembly, and to petition the government for a redress of grievances. Also in the Bill of Rights, adopted as the 7th Amendment, is the right guaranteeing all Americans a trial by a jury of one’s peers. History tells us that before 1688, English judges were servants under the King of England. These judges were often biased towards the King, and because of this, their rulings were not always fair. During the Act of Settlement of 1701, English judges won their independence from the King, but judges in the American colonies were still biased towards the British Crown. King George III got rid of trials by juries in the colonies which made colonists very upset and fueled the fire that led to the American Revolution. When the Framers wrote the Bill of Rights, they understood how important it was to have a fair court system, so they made sure that the right to trial by jury was a fundamental law of the new nation. Unfortunately, powerful interests launched a campaign to erode the 7th Amendment through an effort known as “tort reform.” A tort is a legal term meaning civil wrongs recognized by law as grounds for a lawsuit. These wrongs result in an injury or harm constituting the basis for a claim by the injured party. A strong effort was launched by these powerful interests, spending millions of dollars to lobby the Congress and the state legislatures to pass laws placing restrictions on the right of injured parties to hold the powerful interests responsible for their negligent conduct, including caps on monetary damages. The very same corporations who make millions and billions of dollars from those who consume their goods and services seek to limit their responsibility when their consumers are injured through no fault of their own. While the facts do not show that our trial by jury system needs to be altered, the powerful interests continue in their efforts to limit our constitutional right to justice. Fortunately, organizations such as Take Justice Back and Let America Know have fought back to protect the 7th Amendment, to ensure that all Americans continue to have the right to hold powerful interests responsible for their reckless and negligent conduct. Our time-honored right of trial by jury, for which our revolutionary generation and the framers of our Constitution fought so hard, is vital to our democracy. Our Pledge of Allegiance concludes, “With Liberty and Justice for All.” Without the guarantees provided for in the 7th Amendment, the constitutional right to justice cannot be served. If you have been injured by another person’s careless acts, contact the Manchester injury attorneys at the Law Office of Manning & Zimmerman PLLC at (603) 624-7200 for a free consultation. It is essential that you have competent legal representation from the onset of your case through litigation. Big insurance companies have lawyers looking out for their interests and you should too! To subscribe to our Manchester injury attorneys newsletter, click here. We are also on Facebook and you can follow us on Twitter.